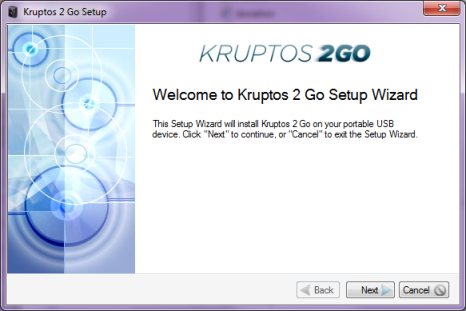 (1) Open your USB device and double click the Kruptos 2 Go icon. Enter your password and password hint then click the "Create" button. Your Kruptos 2 Go USB Vault will now be created and opened. It can be difficult to choose a good password. A password should be fairly long and shouldn't be guessable, but at the same time it should be easy to remember. If a pass word is too difficult to remember you will find that you need to write it down, which is not a good idea. Use the first letters of a phrase or saying, or misspell words, for example "To Be Or Not To Be" could become "2BON2B"
Use two or more words together, for example "1MoreExample"
Your master password is very important. If you lose this password then you will not be able to decrypt your files. Your files will be automatically encrypted using your master password. 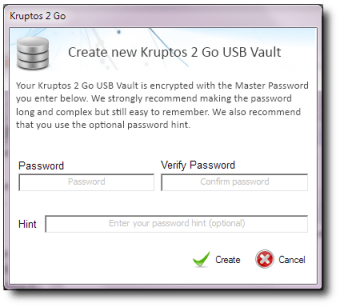 Choose the files or folders you would like to add to your Kruptos 2 Go USB Vault and click "Ok"
Your files will be automatically decrypted using your master password. Navigate to the desired location and select "Extract"
Viewing your secured files is easy too. 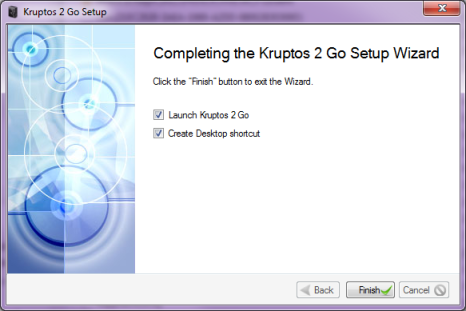 Simply double click and Kruptos 2-Go will automatically decrypt and open your file. 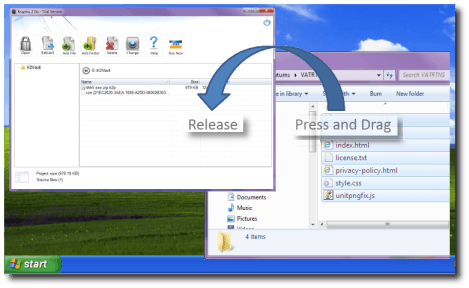 Any changes made are automatically encrypted when you close the file. Any saved changes will automatically be encrypted when you close the editing\viewing program. Please do not remove your USB Drive whilst editing a file as any changes made will not be saved. If you have a lot of files stored in your USB Vault, changing password may take several minutes to complete. Pressing the "Cancel" button whilst changing your USB vault password may take several minutes to complete. 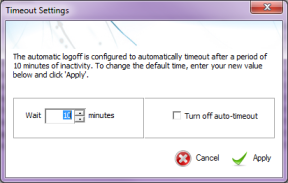 Kruptos 2 Go is configured to automatically time-out after a period of time inactivity on your computer. You can configure the period of inactivity or turn off auto-timeout via the timeout settings window. 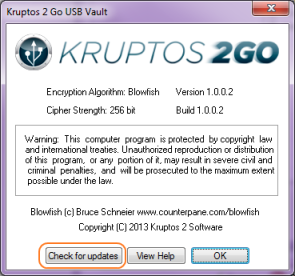 Kruptos 2 Go will now check to see if any updates are available for download. 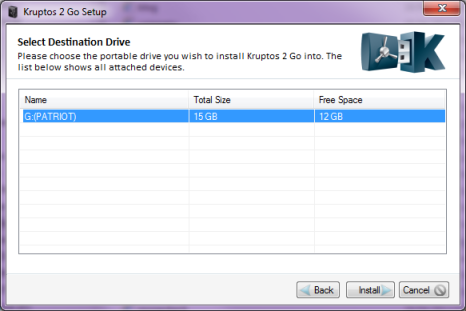 When you “install” Kruptos 2 Go to your USB drive the software is not really installed but rather copied to your drive, for this reason you will not see an option within Add/Remove programs to remove Kruptos 2 Go. 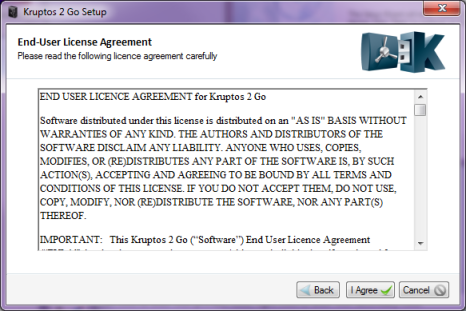 IMPORTANT: This Kruptos 2 Go (“Software”) End User Licence Agreement (“EULA”) is a legal agreement between you (either an individual or, if purchased for an entity, an entity) and Kruptos 2 Software. READ IT CAREFULLY BEFORE COMPLETING THE INSTALLATION PROCESS AND USING THIS SOFTWARE. It provides a licence to use this software and contains warranty and liability disclaimers. BY DOWNLOADING OR INSTALLING THE SOFTWARE YOU ARE INDICATING YOUR FULL AND VOLUNTARY ASSENT TO THE TERMS OF THIS LICENCE. If you do not agree to all of the following terms, do not install the software or discontinue use immediately and destroy all copies on your computer. 1.1 Trial Period Licence. You may download and use the Software for free for thirty (30) Trial-uses after installation ("Trial Period"). During the Trial Period, Kruptos 2 Software grants you a limited, non-exclusive and non-transferable licence to copy and use the Software for evaluation purposes only. The evaluation copy of the Software is fully functional. 1.2 Licences after Trial Period. 1.4 Subject to the terms and conditions of this Agreement, you are granted a limited non-exclusive licence to use the Software on any number of USB Devices. This Licence is not a sale of the Software or any other copy. Kruptos 2 Software retains title and ownership of the Software and documentation, including all intellectual property rights. No title to the intellectual property in the Software is transferred to you. You will not acquire any rights to the Software except as expressly set forth herein. 1.6 Kruptos 2 Software reserves the right within its sole discretion to modify the terms of its licence for all future versions of Kruptos 2 Go. 2.0 End User Support: At Kruptos 2 Software’s discretion, Kruptos 2 Software may provide limited support through email. 3.1 You may not alter, merge, modify, adapt or translate the Software, or decompile, reverse engineer, disassemble, or otherwise reduce the Software to a human-perceivable form. 3.2 You may not sell, rent, lease, sub licence, transfer, resell for profit or otherwise distribute the Software, its documentation, or any part thereof. 3.3 You may not modify the Software or create derivative works based upon the Software. 3.4 You may not remove or obscure any copyright and trademark notices relating to the Software. This Agreement gives you limited rights to use the Software. Kruptos 2 Software retains any and all rights, title and interest in and to the Software and all copies thereof, including copyrights, patents, trade secret rights, trademarks and other intellectual property rights. All rights not specifically granted in this Agreement, including International Copyrights, are reserved by Kruptos 2 Software. The structure, organization and code of the Software are valuable trade secrets and confidential information of Kruptos 2 Software. THIS SOFTWARE IS PROVIDED "AS IS" WITHOUT WARRANTY OF ANY KIND, WHETHER EXPRESS, IMPLIED, OR STATUTORY, INCLUDING, BUT NOT LIMITED TO, THE WARRANTIES OF MERCHANTABILITY, FITNESS FOR A PARTICULAR PURPOSE, AND NON-INFRINGEMENT. THE ENTIRE RISK AS TO THE QUALITY AND PERFORMANCE OF THIS PRODUCT IS WITH YOU. SHOULD THIS PRODUCT PROVE DEFECTIVE, YOU ASSUME THE COST OF ALL NECESSARY SERVICING, REPAIR, OR CORRECTION. IN NO EVENT WILL ANY (CO)AUTHOR OF THIS SOFTWARE, OR ANY APPLICABLE COPYRIGHT/TRADEMARK OWNER, OR ANY OTHER PARTY WHO MAY COPY AND/OR (RE)DISTRIBUTE THIS PRODUCT OR PORTIONS THEREOF, AS MAY BE PERMITTED HEREIN, BE LIABLE TO YOU OR TO ANY OTHER PARTY FOR ANY DAMAGES, INCLUDING, BUT NOT LIMITED TO, ANY DIRECT, INDIRECT, GENERAL, SPECIAL, INCIDENTAL, PUNITIVE, EXEMPLARY, OR CONSEQUENTIAL DAMAGES (INCLUDING, BUT NOT LIMITED TO, CORRUPTION OR LOSS OF DATA, ANY LOSSES SUSTAINED BY YOU OR THIRD PARTIES, A FAILURE OF THIS PRODUCT TO OPERATE WITH ANY OTHER PRODUCT, PROCUREMENT OF SUBSTITUTE GOODS OR SERVICES, OR BUSINESS INTERRUPTION), WHETHER IN CONTRACT, STRICT LIABILITY, TORT (INCLUDING, BUT NOT LIMITED TO, NEGLIGENCE) OR OTHERWISE, ARISING OUT OF THE USE, COPYING, MODIFICATION, OR (RE)DISTRIBUTION OF THIS PRODUCT (OR A PORTION THEREOF) OR OF YOUR PRODUCT (OR A PORTION THEREOF), OR INABILITY TO USE THIS PRODUCT (OR A PORTION THEREOF), EVEN IF SUCH DAMAGES (OR THE POSSIBILITY OF SUCH DAMAGES) ARE/WERE PREDICTABLE OR KNOWN TO ANY (CO)AUTHOR, COPYRIGHT/TRADEMARK OWNER, OR ANY OTHER PARTY. 7. THIS SOFTWARE MAY INCORPORATE IMPLEMENTATIONS OF CRYPTOGRAPHIC ALGORITHMS THAT ARE REGULATED (E.G., SUBJECT TO EXPORT/IMPORT CONTROL REGULATIONS) OR ILLEGAL IN SOME COUNTRIES. IT IS SOLELY YOUR RESPONSIBILITY TO VERIFY THAT IT IS LEGAL TO IMPORT AND/OR (RE)EXPORT AND/OR USE THIS PRODUCT (OR PORTIONS THEREOF) IN COUNTRIES WHERE YOU INTEND TO USE IT AND/OR TO WHICH YOU INTEND TO IMPORT IT AND/OR FROM WHICH YOU INTEND TO EXPORT IT, AND IT IS SOLELY YOUR RESPONSIBILITY TO COMPLY WITH ANY APPLICABLE REGULATIONS, RESTRICTIONS, AND LAWS. 8. YOU SHALL INDEMNIFY, DEFEND AND HOLD ALL (CO)AUTHORS OF THIS SOFTWARE, AND APPLICABLE COPYRIGHT/TRADEMARK OWNERS, HARMLESS FROM AND AGAINST ANY AND ALL LIABILITY, DAMAGES, LOSSES, SETTLEMENTS, PENALTIES, FINES, COSTS, EXPENSES (INCLUDING REASONABLE ATTORNEYS' FEES), DEMANDS, CAUSES OF ACTION, CLAIMS, ACTIONS, PROCEEDINGS, AND SUITS, DIRECTLY RELATED TO OR ARISING OUT OF YOUR USE, INABILITY TO USE, COPYING, (RE)DISTRIBUTION, IMPORT AND/OR (RE)EXPORT OF THIS PRODUCT (OR PORTIONS THEREOF) AND/OR YOUR BREACH OF ANY TERM OF THIS LICENSE. 9. IF YOU ARE NOT SURE WHETHER YOU UNDERSTAND ALL PARTS OF THIS LICENSE OR IF YOU ARE NOT SURE WHETHER YOU CAN COMPLY WITH ALL TERMS AND CONDITIONS OF THIS LICENSE, YOU MUST NOT USE, COPY, MODIFY, CREATE DERIVATIVE WORKS OF, NOR (RE)DISTRIBUTE THIS PRODUCT, NOR ANY PORTION(S) OF IT. YOU SHOULD CONSULT WITH A LAWYER. 10. Termination of EULA: This Agreement is effective until terminated. This Agreement, including the licence to use the Software, will terminate automatically if you fail to comply with any term or condition. 11.1 Kruptos 2 Software reserves the right at any time to cease the support of the Software and to alter prices, features, specifications, capabilities, functions, licensing terms, release dates, general availability or other characteristics of the Software. 11.2 If any provision hereof shall be held illegal, invalid or unenforceable, in whole or in part, such provision shall be modified to the minimum extent necessary to make it legal, valid and enforceable, and the legality, validity and enforceability of all other provisions of this Agreement shall not be affected. 11.3 You may not assign this Agreement. Any attempt by You to assign this Agreement will be null and void.